sale yarn, originally uploaded by All Things Mimi. I have become quite the yarn hound. I suppose that is a logical by product of knitting. My friend Kim owns a yarn shop here in town, The Yarn Gallery, and I went over to help her move into her new digs this morning. She is now located in the Memory Lane scrapbooking store. 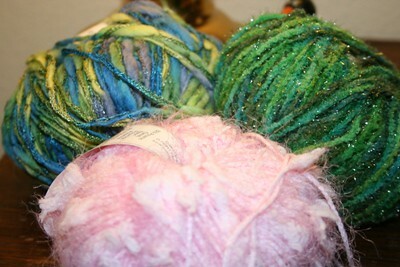 We spent the morning putting yummie yarn in bins at her new shop. It was inevitable that I'd start making a pile of orphan yarn balls to take home with me. These 3 really spoke to me. The pink one because it is so impossibly soft and fuzzy. The two blue-green ones because I thought it would be neat to knit them together into a scarf or a hat. Who knows? Sometimes you just buy yarn because it calls to you. Thank-you again for all the help yesterday - you're awesome! The scarf looks great, and if you need help with the socks, feel free to come by - I am glad to help.